I really like having these natural baby cleaning wipes on hand. They are great to have around with my new baby who is always dropping her pacifier on the ground. I use these wipes to clean up her pacifier safely before giving it back to her. I also use it for wiping down the shopping cart for my toddler and other similar uses when we are out and about. I do not use them on my children's skin directly because the directions say not to do so. These are natural wipes though and safe for regular use. I also use them at home to clean the toys other kids play with while over here if they are not feeling one-hundred percent. When using them on the go I do take a large stack off the roll inside the container and just place them into a plastic sandwich bag, this makes them much easier to fit in my already full diaper bag. 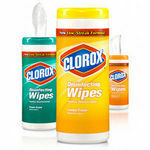 The container is nice and air tight and keeps the wipes moist up until the very last one. These are fragrance free so they should not cause any allergic reactions. When you have a baby in the house you want to keep things as clean as possible. I find myself cleaning my daughter's toys at every chance I get. If a toy goes with us to a restraunt, park, or doctor's office it has to be cleaned before it is returned to the playroom. If we have friends over for a play date I clean everything in site because, well, you just never know what germs are floating around. In the bginning I really struggled with the right way to clean my daughter's things. 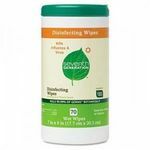 I didn't want to use disinfecting wipes unless I then washed everything really well after to get the chemicals off. I felt the same way with bleach, which left me basically washing everything twice. Once to get the germs off and a second time to get the chemicals out. Life was not allowing me this luxury of time and things weren't getting cleaned as often. Then I discovered Dapple Toy Cleaning Wipes. Wow, what an easy solution! 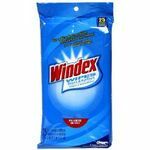 These wipes come in a convenient container that allows me to quickly pull out a wipe and wipe anything down. And I felt confident that if my daughter then immediatly put that toy into her mouth it was ok because they are natural and safe. Great product! And they have travel wipes.. yay! I LOVE my Dapple Wipes! I first used these while I was pregnant. I was a nanny for twins and the family was very conscious about chemicals around their babies and me. I loved using them so much then that I continued to use them for my son. I love that it comes in a wipe, so I can just clean off his toys as soon as they hit the ground and don't have to drag out a bunch of sprays and rags. Because they are all natural I do not feel guilty about using them and then the toy going right into my son's mouth. Also, the smell is pleasant and not awful like some of the other natural cleaning wipes. I even carry a little pouch of them in my diaper bag. Sometimes the toys can get a little foamy from the wipe, but it is not really too big of a deal. I am a little OCD when it comes to germs, but I feel like my son's toys are clean when I use these. Definitely wish they were cheaper. 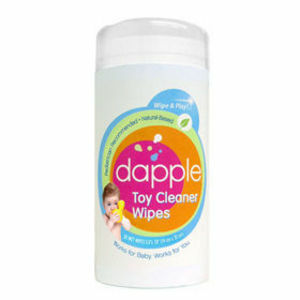 Dapple Toy Cleaner Wipes are more natural/safer than most. Dapple Toy Cleaner Wipes are what I use at home to clean, not only for toys but to wipe down tables and many other things around the house as well. 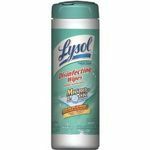 Dapple Toy Cleaner Wipes come in either a stand up tube similar to other cleaning wipes (like Clorox, Seventh Generation, Lysol, etc) or in a convenient soft travel case (similar to a baby wipe travel pack) that I like because I can use it to wipe down hands and objects on the go. Dapple Toy Cleaner Wipes have really impressed me because they have more natural ingredients (like baking soda) than any other cleaning wipe I have ever tried and with a toddler in the house that is important because it's much safer, more natural, and healthier than using chemicals. Plus, I don't have to worry about my toddler touching the wipes to help me clean or getting into them when exploring. My only complaint is that the "pop up" function of the wipes through the top of the canister has not worked well. Other than that, they are durable and great! Last month I received the swell news that I was runner-up for Dapple Baby's Blog Contest. It was a Grandparent's Day Pictures Contest and participants were asked to send pictures of their grandchild(ren) and themselves. Winners were chosen as to how much the children looked similar to the grandparent. For verification purposes you can go to dapplebaby dot blogspot dot com and look for the link to the contest. Once there you will see me with my two grandchildren or see the picture enclosed below. My winning gift was a package of **DAPPLE SURFACE WIPES. **Dapple offers a line of green cleaning, eco-friendly products specifically designed for households with little children. They are safe. 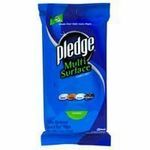 I was most impressed by their surface wipes because, unlike similar products, there is a seal to make sure that the wipes never dry out. Finally! The cloths seem to be thicker than products that I have used in the past and they also create some suds. I was very happy to receive them and started cleaning everywhere. I even used on my laptop screen and it came out very nice. When I heard the price, I became discouraged. It just seems a little outrageous for the small amount that you receive. I would like to recommend but most of my friends would feel the same. I often wonder does Going Green always have to be so expensive?